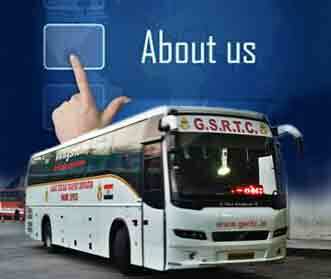 Gujarat State Road Transport Corporation (GSRTC) is a passenger transport organisation providing bus services both within Gujarat and neighbouring states. This remarkable growth is an outcome of unflagging effort of more than 39,795 workforce, dynamic management and sustained support from the state govt. It has built up formidable technical facilities. Three level maintenance and repair facility - 125 depot workshops, 16 divisional workshops and a central workshop. Bus body building plant (1000 bus bodies / year). Online ETM Machine GSM / GPRS Module Ready will be introduced.